Solutions designed for people, not engineers. Today's education institutions need effective communication systems to enhance safety and learning. This communication includes audio, video, and digital data networks between rooms., buildings, and campuses. CareHawk communications solutions are easy to use AND meet these technology requirements. Newtech Systems is an authorized CareHawk dealer. Trained Certified system technicians and experience sales staff can design and support your communication system. Newtech Systems is an authorized UTC Fire and Security communication dealer. Trained Certified system technicians and experience sales staff can design and support your communication system. From the MCS350 system to the top of line StarCall with VoIP interface UTCFS and Newtech systems can meet your communications needs. The UTCFS MCS350T and MCS350 Series are multichannel, microprocessor-controlled, programmable administrative communications systems that provide a range of audio communications functions. 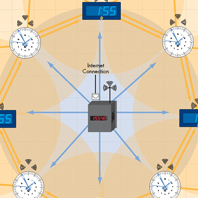 These functions are initiated from any one of up to three (MCS350T) or four (MCS350) Administrative Control Consoles (ACCs) that can be connected to the system. The entire system of ACCs and up to 240 (MCS350T) or 256 (MCS350) remote stations are controlled by a GE Model MCS350T or MCS350 Central Control Unit (CCU). Two-way open voice communications can be initiated from an ACC to any remote speaker station or to another ACC. Paging and program distribution can also be initiated by an ACC to any one station or group of remote stations. The built-in master clock can be programmed to control time tone distribution to any or all remote stations. The master clock can correct selected synchronous clocks or selected digital clocks. The clock has battery backup to maintain correct time for seven days after power loss. The MCS350T System also allows most DTMF telephones to access the communications channel for two-way open voice communications and paging. DTMF telephones can call any ACC or talkback-capable remote station in the system and make zone, all call, or emergency pages. DTMF telephones can also initiate manual time tones and a custodial call tone, and have last number redial capability. The UTCFS StarCall family of intercommunications and timekeeping solutions brings usability, flexibility, and cost effectiveness within easy reach of all industrial/commercial/institutional settings, including schools, offices, small businesses, and correctional facilities. StarCall lets you determine the level of sophistication you need for your application by offering three communications and timekeeping feature sets-each geared to a specific level of service; each offering precisely the capabilities you need to get the job done right. This layered solution means you won't be shoehorned into a system that can't keep pace with the needs of your building, and you wont find yourself rattling around in a system heavy with costly features that go unused. It also means there is always a clear and cost-effective migration path to higher-end features and increased capacity, should building expansion or changes in occupancy warrant an upgrade in the future. "Do you know what time it is?" When you ask or look around many schools, offices, hospitals, and other facilities, you'll get several different answers to this very simple question. Newtech proposes a simple solution -- get in sync! Our family of analog and digital clocks combined with programmable master clocks and other accessories makes keeping and controlling time easier. "Accuracy" By synchronizing the clocks within a facility, you ensure that all personnel inside have the same information. No matter what type of environment, things run more smoothly if the time is accurate and consistent. "Clock Choices" Some applications, like elementary schools, require analog clocks. Others, like higher education, businesses, and healthcare facilities, prefer digital versions. Newtech offers both analog and digital models and we've priced these clocks to be the most competitive available today. "Convenience" To simplify installation, our clock system components can use standard electrical backboxes rather than custom or proprietary versions. This means that our clocks can be installed into most existing wall openings. "Styling" Clocks should be easy to find and easy to read, while fitting into their surroundings. Our clocks are styled to be simple, clearly visible, and neutral to their environment. Architects and engineers will appreciate their adaptability. Our clock systems deliver the accuracy, choices, convenienece, styling, and unique features that your facility is looking for, all at a price you can afford.